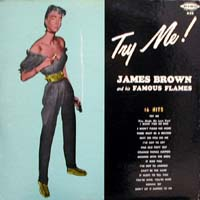 JAMES BROWN and His Famous Flames released their second album "Try Me" using their previous hit "try me" which was recorded in 1958. Rare first issue with girl smoking cigarette and getting a smoking gun. This album was reissued for the first time in 1964 under the title "The Unbeatable James Brown: 16 Hits".